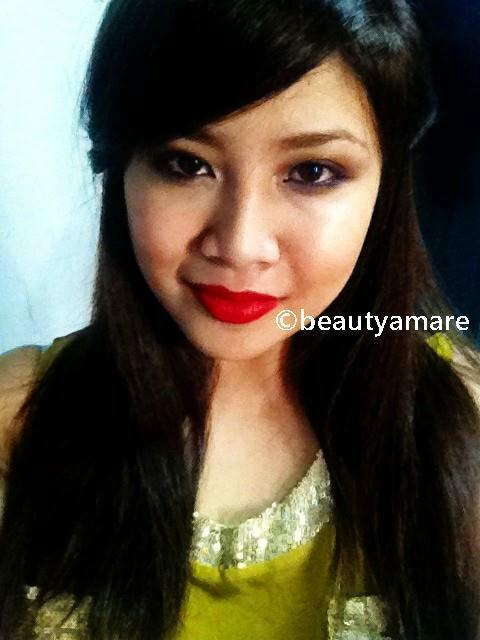 beautyamare: What Red Lipstick is Red For You? 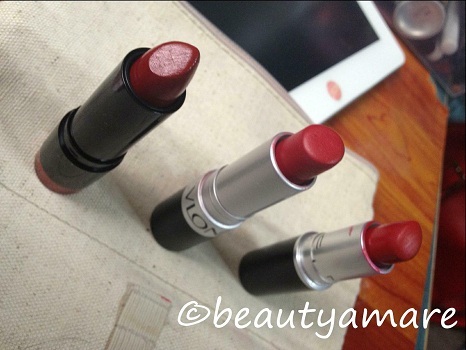 What Red Lipstick is Red For You? Women are overly crazy with RED lipsticks. I am on the average. I love red but I don't know why I only love to wear it in a cold place like in my hometown in Philippines (Malaybalay City, Bukidnon). Maybe Singapore is too humid for me, so I usually wear it once or twice a week but I definitely love this for special night events. Ok, let me go through with the three lipsticks I have here. This is the latest lipstick I have and I am absolutely surprised with the quality in ratio of the price. I have not seen any stores selling NYX here in Singapore but my roommate said there is one in Novena Square Shopping Mall. I usually buy my Nyx products via online. All I can say is that Nyx Snow White is gorgeous red with blue undertones. This lipstick is creamy so it looks like you put a gloss over it. The color is too much for daytime wear but definitely a go-to for night affairs. The darkest tone among the three. What I don't like about Snow white is that it smudges easily on my lips or maybe because Singapore is just too humid. Absolutely affordable from SGD5.90-7.50ea here in Singapore and PHP220.00-280.00ea in Philippines(online searches). Verdict: Highly Recommended for those the budget is a concern.Worth buying in ratio of the quality to the price. The packaging is very pretty and easy to store with great labeling. I consider this to be wearable during daytime because of the orange undertone. A very beautiful bright red. Really Red is matte, so I don't worry that it moves around. It actually stays on my lips no matter how humid the weather is, however this does not lasts long on my lips. I am not lazy to re-apply so It's not a problem to me. I got this at 20% discount in Watsons Bishan Junction 8 Mall which is about SGD15.90ea if am not wrong. I believe it is cheaper in Philippines at PHP475.00ea according to some ads (Please leave a comment on the exact amount if you bought one in Philippines). Verdict: Highly Recommended.My favorite among the three because it is not so expensive and wearable during daytime. The packaging is as great as Nyx Snow White. The most expensive among the three lipsticks. This is the first red lipstick I wore a year ago which was introduced to me by my roommate. A stunning Neutral Red. 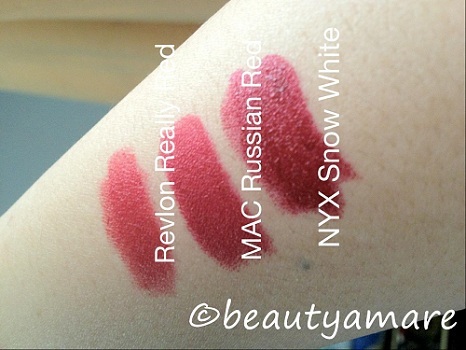 Not so dark-toned compared to Nyx Snow White but not as bright as Revlon Really Red. I consider this wearable during daytime. Compared to Revlon Really Red, this lipstick last all day long. 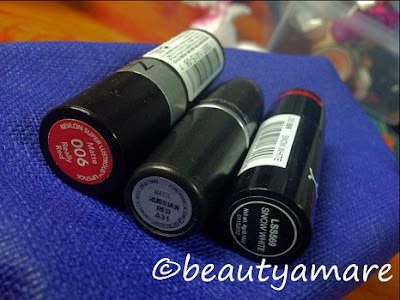 MAC lipsticks here in Singapore is about SGD28.00ea (Php980.00ea) which you can but at a few stores in Singapore.I really don't know the price of MAC lipsticks in Philippines so please leave a comment below if you do so. Verdict: I am a MAC lover but my concern is the price which is expensive compared to Revlon Really Red which the color is almost the same. If you can afford MAC, I would definitely and highly recommend this. As ever, I hate the packaging because it does not have a color coding unlike Nyx and Revlon, so it's very difficult for me to identify with other MAC lipsticks. YES! I think I am done with my review based on my personal experience with the lipsticks. Disclosure of our website is at it is. I still don't have any picture wearing the Nyx Snow White but I will definitely post soon.